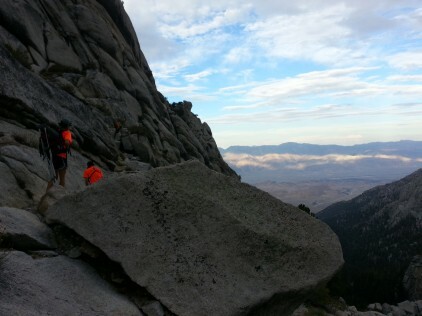 Around 15:00 on Sunday, September 1, Inyo SAR was called to assist a woman near Upper Boy Scout Lake in the Mount Whitney region. She had injured her ankle after slipping on wet granite. 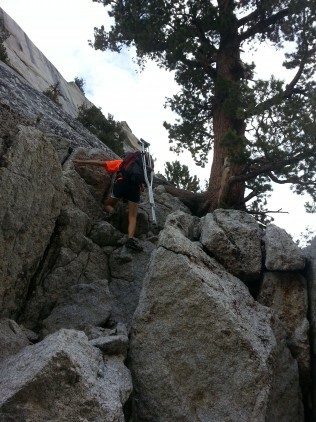 Two rescuers from Lone Pine headed up the trail and reached the injured party around 16:30 just above the steep, exposed ledges on the North Fork trail known as the Ebersbacher Ledges. The patient’s 17-year old son had assisted her in making her way down from the lake. Four rescuers drove down from Bishop and hiked up the trail, reaching the group around 17:30 equipped with crutches and sufficient gear to lower the patient down the ledges if necessary. Upon arrival, two EMTs performed an assessment, revealing swelling and pain upon palpation of the affected ankle. A third party had taped the ankle prior to SAR members’ arrival. Both feet had intact motion, sensation and circulation. 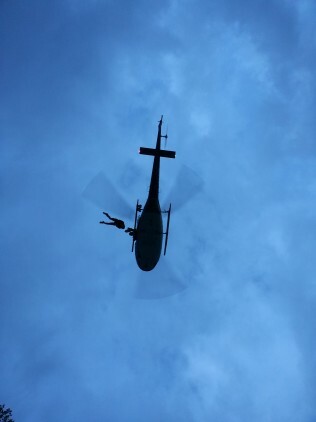 A helicopter was on its way to the scene but, fearing air support would not arrive before darkness, the team built an anchor and prepared to lower the patient down the ledges. The helicopter made it just before sundown and was able to extract the patient from the ledges by hoisting her with a long line. The patient was taken to Southern Inyo Hospital where she received treatment. The patient’s son hiked out with team members after dark and got to his car safely. Posted in 2013, Missions Reports.